STUDENT: I observed that up to this point, the effect on the financial statements of each individual transaction has been described separately. I.e., starting with the item "Cash, $5,000" on a balance sheet, a transaction involving an increase of $1,000 in cash would be recorded, in effect, by erasing the $5,000 and putting in the new number, $6,000. Teacher, I doubt that this is the correct procedure in real life accounting, is it? TEACHER: Good observation. This procedure was appropriate to explain the rationale of the transaction. Obviously there was a the small number of transactions we have been dealing with. As you correctly suspect, such a technique is not a practical way of handling the large volume of transactions that occur in actual business operations. Therefore in this Module we describe some of the bookkeeping procedures that are used in practice. STUDENT: Are you going to modify the basic concepts we have been dealing with? TEACHER: Absolutely not. Let me state, emphatically, that no new accounting concepts will be introduced; the devices we will discuss here are no more than the practical means of increasing the facility with which transactions can be recorded, summarized and controlled. STUDENT: I hear all this work is now done by computers, right? TEACHER: The mechanical processing is mostly done by computers, but the decision on how to record each individual transaction is a task for humans, as is the case for any task that involves judgment. We will first describe the procedures used in a manual system, that is one in which the numbers are recorded by hand. In this way we will clearly understand the rationale of the process. After that we will show the similarities and the differences between this manual system and a computer based system. STUDENT: Bookkeeping? I assumed you would be training me in Financial Management! TEACHER: Don’t worry. We will not discuss bookkeeping procedures for the purpose of training you as a bookkeeper. But some knowledge of these procedures is nevertheless necessary for the effective financial management of a company. There are other advantages in describing the actual bookkeeping procedures. As is the case with many subjects, accounting is something that is best learned by doing, by the actual solution of problems. True, any accounting problem can be solved without the aid of the tools discussed in this Module, but their use will often speed up considerably the problem-solving process. STUDENT: So, what exactly will we discuss? TEACHER: The debit-and-credit mechanism is the principal technique we will discuss here. Did you learn some elementary algebra at school? STUDENT: Well, yes, some, and elementary is a good word to describe it! Why do you ask? TEACHER: Because the debit-and-credit mechanism provides a framework for analysis that has much the same purpose, and the same advantages, as the symbols and equations of elementary algebra. This mechanism can often be used to reduce an apparently complex, perhaps almost incomprehensible, statement of facts to a simple, specific set of relationships. Thus, the debit-and-credit mechanism provides a useful way of thinking about many types of business problems -not only strict1y accounting problems but also problems of other types. Consider again a balance sheet on which the item "Cash, $5,000" appears. Subsequent cash transactions can affect this amount in only one of two ways: they can increase it, or they can decrease it. St. You already told me that the simple procedure of increasing or decreasing the item by erasing the old amount and entering the new amount for each transaction is not advisable. TEACHER: No, because, considerable effort can be saved by collecting all the increases together and all the decreases together and then periodically calculating, in a single arithmetic operation, the net change resulting from all of them. Any idea of how this could be done? STUDENT: I guess that by adding the sum of the increases to the beginning amount and then subtracting the sum of the decreases. TEACHER: Correct. Obviously, the difference is the new cash balance, reflecting the net effect of all the separate increases and decreases. All increases are listed on one side, and all decreases are listed on the other. Also note that the dollar sign. ($) is omitted; this is the usual practice in most accounting procedures. STUDENT: I see how much easier this procedure is than changing the balance every time a transaction takes place. TEACHER: The saving in effort can be seen even from this simple illustration. If the balance were changed for each of the seven transactions listed, three additions and four subtractions would be required. By using the account device, the new balance is obtained by only two additions (to find the 8,000 and 4,000) and one subtraction (8,000 - 4,000). STUDENT: I guess that in actual accounting systems, other useful information, in addition to the amount of each increase or decrease, is normally recorded. The example you showed does not tell us anything about the causes of the increases and decreases in the cash balance. Here the concept of "management accounting" enters. The number of accounts depends on management's need for information. For example, although the single item "accounts receivable" ordinarily appears on the balance sheet, a separate account for each customer is often maintained in a ledger so as to show how much is owed by each. There my also be higher level accounts for groups of customers classified by size, physical location, type of business, etc. etc. The conclusion is that there is no limit, other than the cost of record keeping, to the proliferation of accounts that may be found in practice. A journal is a chronological record of accounting transactions showing the names of accounts that are to be debited or credited, the amounts of the debits and credits, and any useful supplementary information about the transaction. Student, please take a look at the illustration and tell me what you notice. STUDENT: Well, I see that the debit entry is listed first, that the debit amounts appear in the first of the two money columns, that the account to be credited appears below the debit entry and is indented, and that credit amounts appear in the second money column. But what is "LF"? TEACHER: LF is an abbreviation for "ledger folio," that: is, the page reference to the ledger account where the entry is to be made; these references are inserted at the time the entry is recorded in the account, and their presence indicates that the entry has been recorded. (In the illustration, the first ten items have been recorded in the accounts, and the remaining two have not yet been recorded. It is usual that a brief explanation is written beneath each entry. STUDENT: Would you please reinforce my understanding of the importance of the journal? TEACHER: The journal contains explicit instructions as to any changes that are to be made to the balances in the accounts. You probably heard the word "posting" in relation to accounting. OK, the process of making the changes as detailed in the journal is called posting. 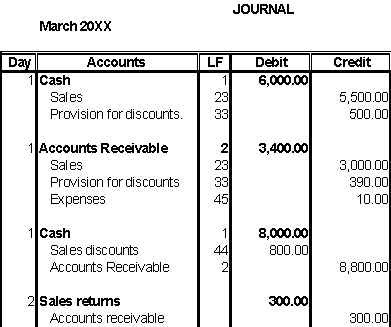 No account balance is ever changed except on the basis of a journal entry. STUDENT: I see now. Entries are first made in the journal; they are later posted to ledger accounts. TEACHER: Exactly. The ledger is a device for reclassifying and summarizing, by accounts, information originally listed in chronological order in the journal. The trial balance is simply a list of the account names and the balances in each account as of a given moment of time, with debit balances in one column and credit balances in another column. STUDENT: Simple. But what for? 2. It provides a convenient transcript of the ledger record as a basis for making adjusting and closing entries or in the preparation of financial statements. STUDENT: Point 1 is easy to understand. To maintain the relationship "Total Assets = Total Liabilities + Owners' Equity," debits and credits must be kept in balance. TEACHER: Sure. Of course the fact that totals on a trial balance are equal does not necessarily indicate that the integrity of the accounting equation has been maintained. Can you think of situations what may not be apparent in trial balance? STUDENT: I guess entries may have been omitted entirely; they may have been posted to the wrong account; offsetting errors may have been made; or the transaction may have been analyzed incorrectly. TEACHER: Very well. For example, when a debit for the purchase of a truck is made incorrect1y to an expense account rather than correct1y to a fixed asset account, the totals of the trial balance are not affected. But the fact is that errors that result in unequal debits and credits are common, and these error are easily detected when a trial balance does not balance; that is, when the debit column does not add to the same total as the credit column. STUDENT: Before we continue, why is there a need for "adjusting" entries? TEACHER: Most of the entries that are to be made in accounts are obvious. When checks are drawn against the company's bank account, it is obvious that an entry must be made crediting Cash and debiting some other account. When invoices are sent out, a credit to Sales and a debit to Accounts Receivable is obviously generated. Entries of this type are called original entries or spot entries. But some events that affect the accounts are not evidenced by such obvious documents. The effects of these events are recorded at the end of the accounting period by means of what are called adjusting entries. The purpose of the adjusting entries is to modify account balances so that they will reflect fairly the situation as of the end of the period. Most adjusting entries are made in connection with events that are, in effect, continuous transactions. Consider a tank of fuel oil purchased for $1,000. On the day of delivery, the $1,000 of fuel oil was an asset, but each day thereafter some fuel oil was consumed in the furnace, whereupon part of the $1,000 became an expense. Rather than record this consumption daily, a single adjusting entry is made at the end of the accounting period to show how much of the fuel oil is still an asset at that time and how much has become expense during the period. A - The case of the fuel oil mentioned above is one example. B - For insurance protection, originally recorded as Prepaid Insurance (an asset), part of which becomes an expense in the current period. C - For rent paid in advance and originally recorded as an expense, part of which becomes an asset (the right to use the rented good). A - Wages earned by an employees during the period but not yet paid to them. B - For interest expense which has not yet been paid. C - For interest (i.e., discount) deducted from a loan in advance and originally recorded as Prepaid Interest (an asset), part of which becomes an expense of the current period. A - For rent collected during the period, and recorded as rent revenue, part of which is applicable to the next period and hence is a liability at the end of the current period. A - For interest earned by the business during the period, but not yet received. OTHER ADJUSTMENTS. Lots of other adjusting entries must be made to make the accounts reflect fairly the results of operations and the status of the business. An example is bad debt expense, an adjustment made in order to recognize the possibility that not all credit customers will pay their bills and that therefore the Accounts Receivable account may overstate the collectible amount of the company's claims against its customers. Revenue accounts and expense accounts are called temporary (or "nominal") accounts, as distinguished from asset, liability, and owners' equity accounts, which are called permanent (or "real") accounts. The temporary accounts are actually subdivisions of owners' equity. They are a convenient means of classifying the various revenue and expense transactions that occur during an accounting period so as to provide the information needed to prepare the income statement for the period. The temporary accounts are periodically closed to owners' equity in order to, determine the net effect (i.e., the profit or the loss) of all the revenue and expense transactions. The closing process consists of transferring the balance of each temporary account to the same side of a clearing account. This is done by making a journal entry debiting the account to be closed if it has a credit balance (or crediting it if it has a debit balance) in an amount equal to the balance. The entry has the effect of reducing the balance in the account to zero, thereby closing it. At the completion of the closing process, all temporary accounts have zero balances; the only accounts remaining open are the permanent accounts. STUDENT: OK, Teacher, what about a nice short summary now? 1. The first, and by far the most important, part of the accounting process is the analysis of transactions, that is, the process of deciding which account or accounts should be debited, which should be credited, and in what amounts, in order to reflect events in the accounting records. This requires judgment. 2. Next comes the purely mechanical step of journalizing original entries, that is, recording the result of the analysis. 3. Posting is the process of recording changes in the ledger accounts, exact1y as specified by the journal entry. This is another purely mechanical step. 4. At the ending of the accounting period, judgment is involved in deciding on the adjusting entries, and these are journalized and posted in the same way as are original entries. 5. The closing entries are journalized and posted. This is a purely mechanical step. 6. Financial statements are prepared. This requires judgment as to the best arrangement and terminology, but the numbers that are used result from the judgments made in Steps No. 1 and No. 4. STUDENT: Thanks, and I guess the mechanical parts are the ones performed mostly by computers, while judgment steps are reserved for humans. Most businesses use one or more subsidiary ledgers, which are groups of related accounts taken out of the general ledger. For example, all the separate accounts for individual customers may be kept in an accounts receivable ledger. In order to keep the general ledger in balance, a control account takes the place of the individual accounts removed to the subsidiary ledgers. A control account shows in summary form debits and credits that are shown in detail in a subsidiary ledger. When subsidiary ledgers are used, each amount is, in effect, posted twice. It is posted, often daily, to the proper account in the subsidiary ledger, and it also becomes a part of the total which is posted at the end of the period to the control account in the general ledger. In a large business, most if not all of the general ledger accounts are control accounts. The imprest fund is another device for saving work. An imprest fund consists of cash advanced to a responsible person and periodically replenished by additional cash that equals the amounts expended by this person. This procedure saves the effort involved in drawing checks and making separate journal entries for small bills. It also provides a safeguard, since the petty cash box should at all times contain cash and receipted bills which together total the amount shown in the Petty Cash account. The imprest device is by no means limited to petty cash. Many government disbursing agencies operate on the same principle, but in amounts that run into millions of dollars. These agencies are advanced funds by the U.S. Treasury Department, they disburse these funds to pay properly authorized bills, and they submit these bills to the Treasury Department as a basis for replenishing the fund. The accounting entries are essentially the same as those given above for petty cash. A system that "can't be beaten" would be prohibitively expensive and time-consuming. A basic principle of internal control therefore is that the system should make it as difficult as is practical for people to be dishonest or careless. Some of the devices used to insure reasonable accuracy have been mentioned already -the idea of verifying one set of figures against another, for example. The idea of divided responsibility is another important one. Whenever feasible, one person should not be responsible for recording all aspects of a transaction, nor should the custodian of assets (e.g., the storekeeper or the cashier) be permitted to do the accounting for these assets. Thus, one person's work is a check on another's, and although this does not eliminate the possibility that two people will steal through collusion, the likelihood of dishonesty is greatly reduced.